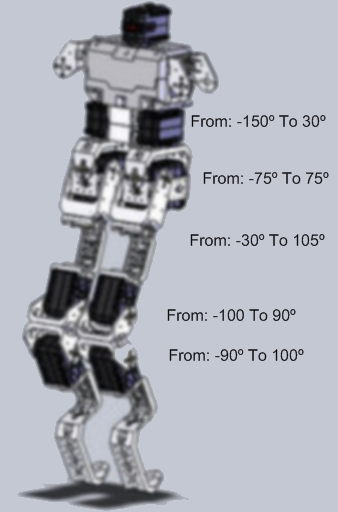 When trying to physically simulate the Jacobian robot is necessary to know what are the servos maximum and minimum angle for each joint so that we don’t rely on the collision, easing the simulation (the physics simulator will still emulate collision as if the rotation axis had a mechanical limit). The Robotis’ Bioloid kit we are using has AX-12 servos. These servos can return the current position of the servo on a given moment. 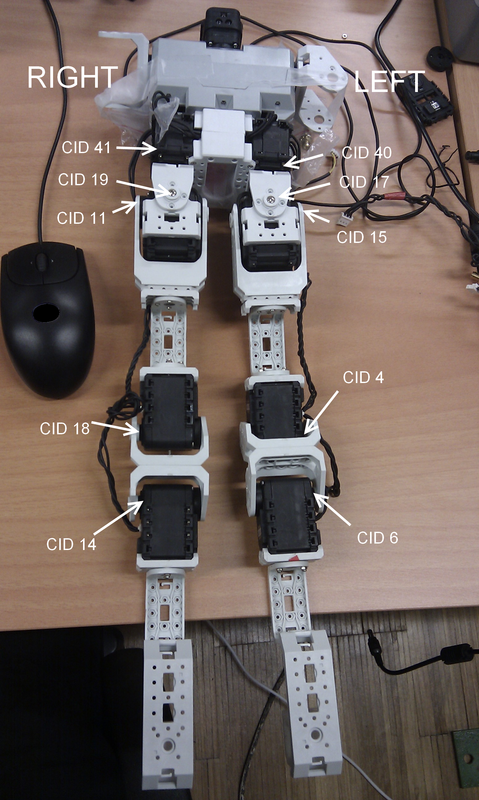 To get the maximum and minimum angle of each joint, we simply adjusted the real servos to the extremes and sampled the position using the Bioloid’s CM5 default firmware and a serial terminal emulator on the PC. 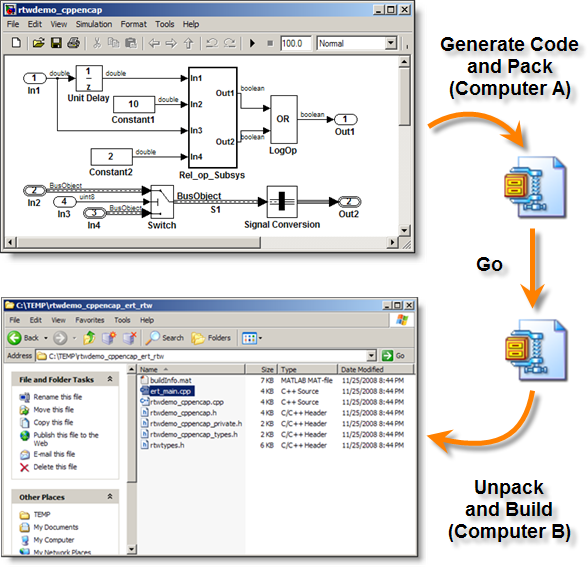 The process of sampling the position is fairly simple, upon connecting the robot with the Boiloid software in the computer, the serial terminal allows interactive chat with the CM5. There is a unique ID to every servo on the bus. To change the servo ID context the command is “cid id”. 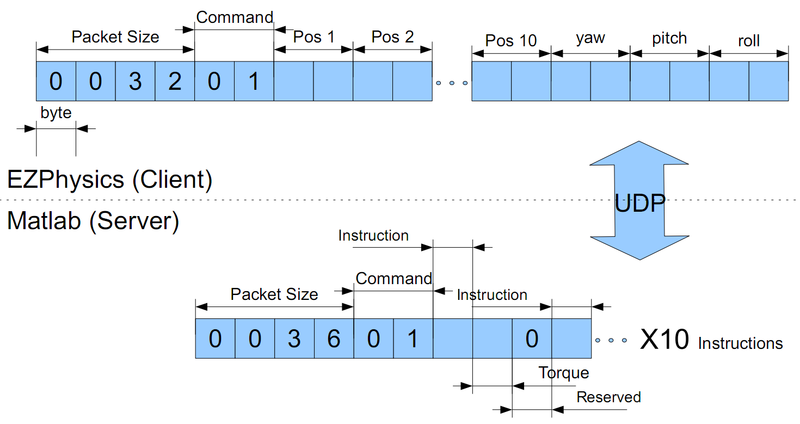 Once in the servos’s scope inserting “read 36 2” will return two bytes: the first for the Low value and the second for the High value. This represents a range from 0 to 1023 which is mapped to 0º to 300º (See below). The values increase clockwise if moving the part and not the rotation cylinder, vice-versa if you are thinking in the perspective of the cylinder. As you can see, the precision of this mechanism may not be great, however for the current purpose of applying some limits in the simulation this values are good enough. 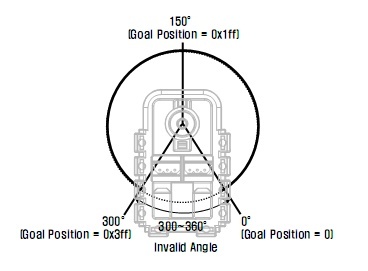 Also keep in mind that some positions (in our case the lying down position with 150º on all engines) should be easy to model in 3D (all aligned, parallel or perpendicular), because it will serve as our reference orientation in the simulation. As previously mentioned, the servo only returns a valid position between 0º and 300º. This can be an issue, for instance, in the 40 and 41 servos we sampled. Although previous planing ensures that this servos can reach this positions it will not be necessary or desired. Hence, determining where the 0º angle is going to be is important. To place the 0º degree angle at the right place it is necessary to use the NxJoint local normal property. Modeling all the parts in the same axis will help to determine this values, please refer to the PhysX documentation on how these values should be set for they will be different depending on the way the models are built. Please refer to the ReadMe.txt inside the folders for instructions on how to compile and use the application. An important remark: it is necessary to have the PhysX drivers installed to run the simulation (even without a PhysX enabled graphics card). This simulation demonstrates a ragdollish fall of the Jacobian model interacting with the floor. The light blue leg (the left one) represents the convex approximation of the model real shape, the real shape is represented by the right leg (with a darker blue). 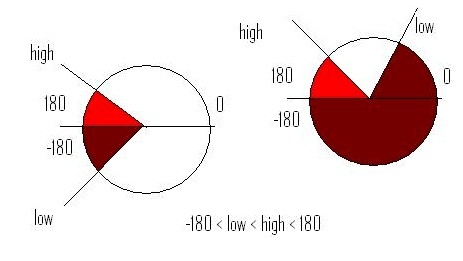 It is visible the similarity between these two shapes. 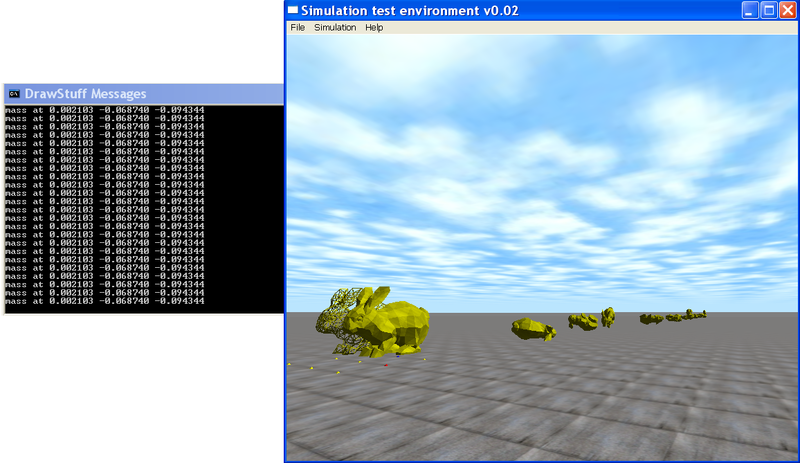 The PhysX debug view is toggled and the orange lines represent the convex meshes used. 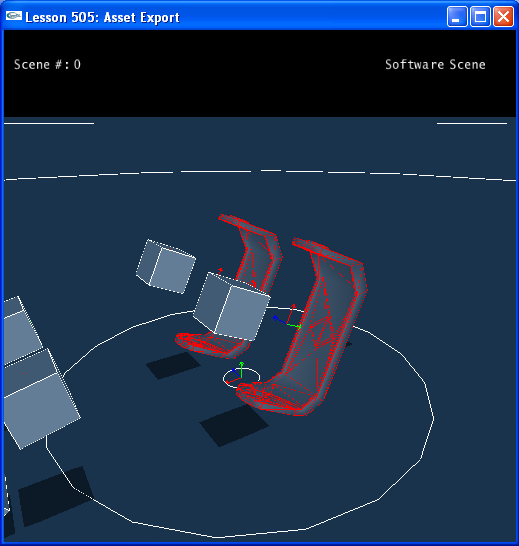 Some cubes are thrown into the scene interacting with the robot and floor and indicating that the collision with the environment works correctly. In the videos below you can see some preliminary tests on applying sinusoidally sequenced torque to the parts that compose the Jacobian Model. There is a “bug” in the way that the torque is applied. Instead of applying it to the body parts in relation to the servo rotation axis, the torques are applied in relation to an axis that is at the center of mass of the body parts. Obviously this is not really the way things work with a multi-servo robotic construct in the real world. The torque in the real world is applied by the servo along the rotation axis. The good news is that convex triangle mesh based collision seems to work. Apart from the simple shapes as a cube or capsule, PhysX allows for Convex Meshs and Triangle Meshs to represent more complex collision objects. Unfortunately, it is usually not possible to use the 3D triangle mesh used for display purpose as-it-is for collision detection. Also it is very important to keep in mind that mesh collision is a computationally expensive operation and should be avoided when possible. Another important fact is that Triangle Mesh to Triangle Mesh collision is not supported by PhysX. 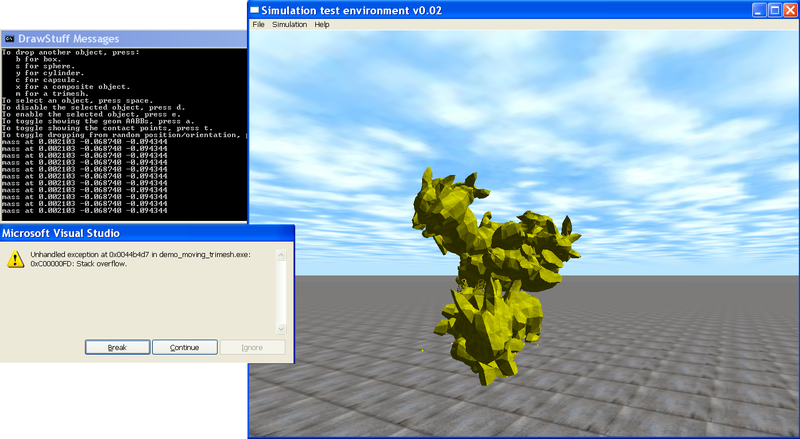 In order to transform a 3D triangle mesh into a collision object PhysX provides an application framework. This process is called cooking by PhysX documentation. The mesh provided as input cooking rarely should be the same than the one being shown on screen, because of the excess of detail and consequent overhead in the physics calculation. 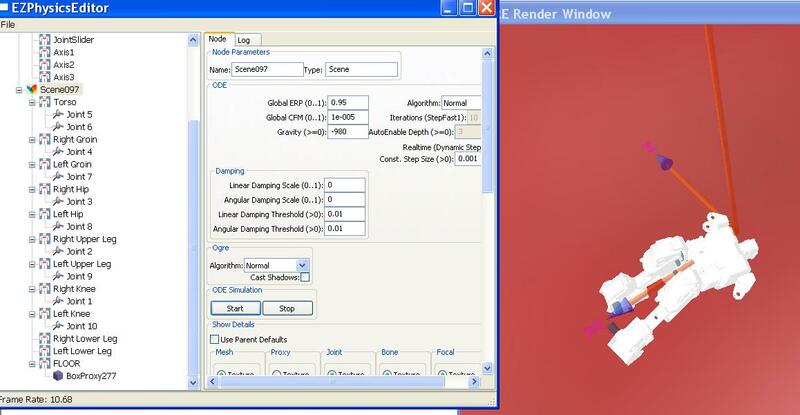 A simplified model should be used, this model may, for instance, be convex (which provides significant less overhead in the simulation) and should consider other minor aspects, such as, reduction of vertex duplication. 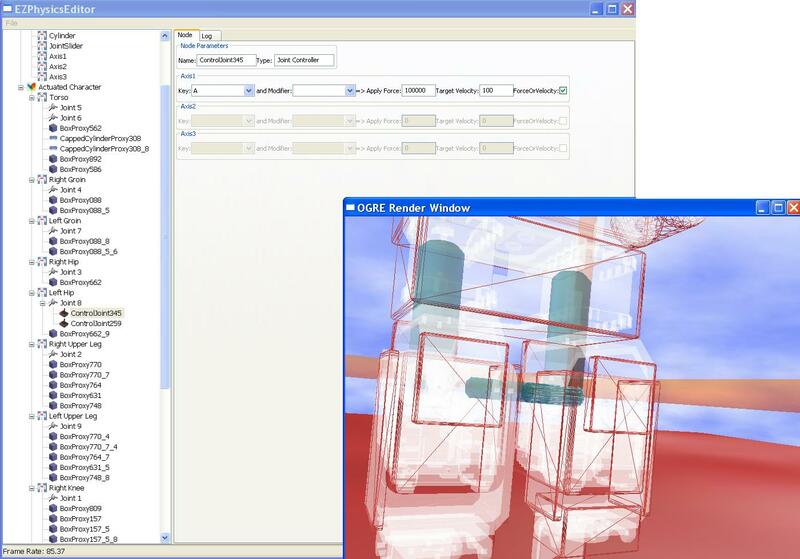 When the mesh is ready it needs to be “cooked” by PhysX, this process can be long but is a one-time-only operation. The output is file in binary format that is optimized for collision detection and can be easily loaded in the shape it represents at run-time. The following code uses the PhysX SDK’s 3DS model wrapper that contains the 3d rendering mesh (other file types and wrappers will have different parameters) and “cooks” it into a collision mesh. In my experience I had another curious difficulty, nothing returned errors but I could not see the mesh. Turns out it was the scale. The scale of a cooked collision mesh (convex or triangle) cannot be changed, so be sure to define the scales used before hand. 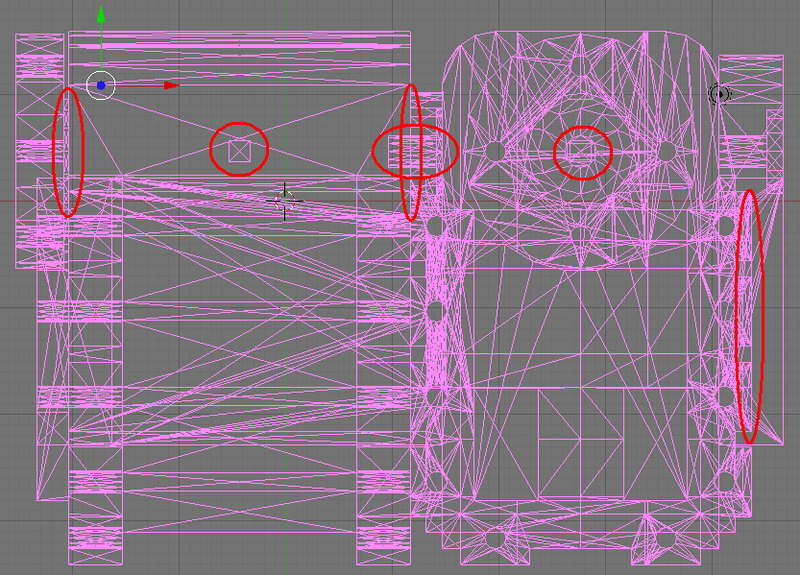 Upon doing so it is only necessary to create a TriangleMeshDescriptor load the mesh in, associate it with a Shape, the Shape with the Actor and collision is ready! The parts also have a triangle mesh and associated textures kept together with the physical data to allow for visual feedback. 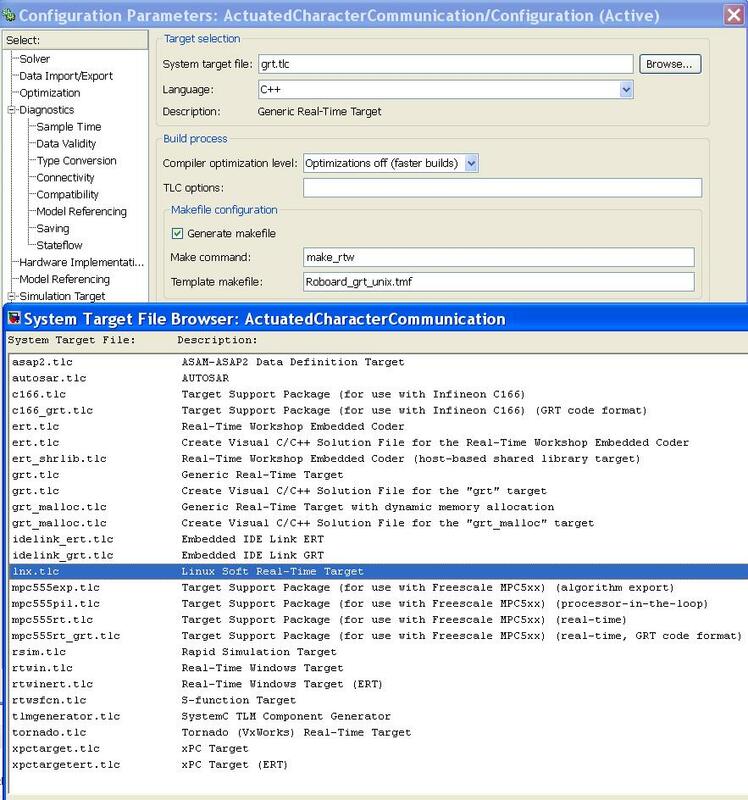 The Collada 1.4.1 file can hold all this information and it is our intention that once all the data has been verified for it to be saved in this standard allowing for easy editing of the parameters once the application is complete. The small XYZ are indicating the center of mass of the part. 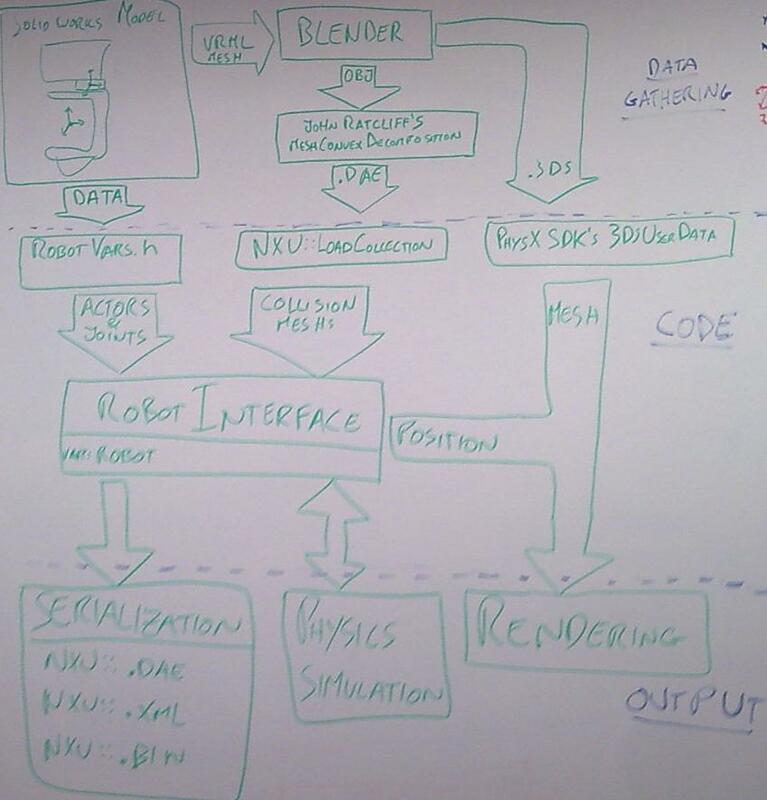 During the past two weeks we have started developing the real-time 3D physics simulation of the robot and its control. 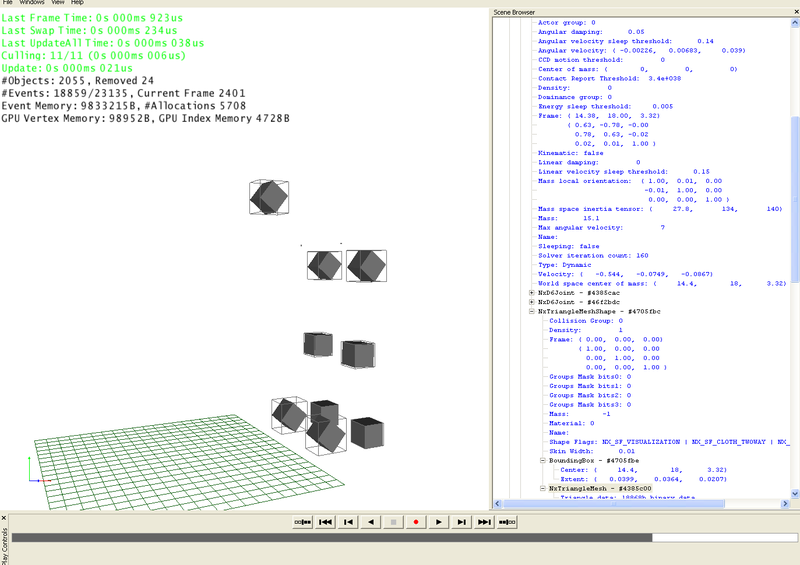 The first step in this endeavor was to find the best tools to simulate Jacobian in a virtual environment.